Detroit resident Walter Dossin had a passion for racing boats. Detroit, from the late Nineteenth Century through the middle of the last century, was a center for boat racing, with important annual events held every summer on the Detroit River near Belle Isle. Guy Lombardo, a popular band leader from London, Ontario, sponsored boats that accomplished much in the championship series. Dossin decided to challenge the boats of Guy Lombardo and commissioned well-known naval architect, Gus Hacker, to design a vessel that would win championships. His creation, Miss Pepsi, was the leading racing boat in 1947. It was the first, or among the first, boats to exceed 100 miles per hour. The J. T. Wing was the last commercially active wooden scooner to sail in the Great Lakes. It reached retirement age in 1949 and a group of Detroit residents decided that it should be docked at Belle Isle and serve as something of a museum of Great Lakes ships. This was called the City Maritime Museum and was the forerunner of what is now the Dossin Great Lakes Museum. Apparently, that wooden vessel deteriorated rapidly and there was no money to repair her. For safety reasons, the use of the J. T. Wing as the City Maritime Museum came to an end in 1956. Walter Dossin and his family were interested in the history of sailing on the Great Lakes. In the mid-1950s, he donated $125,000 to the city for a Marine Museum. The city and Detroit’s Historical Commission matched the Dossin family contribution, so one-quarter million was available to construct the building you see. That amount is equivalent more than two million 2013 dollars. Ground was broken on May 21, 1959 and the structure you see pictured above opened on July 24, 1960. It is located at that point on Belle Isle where the J. T. Wing was moored from 1949 to 1956. 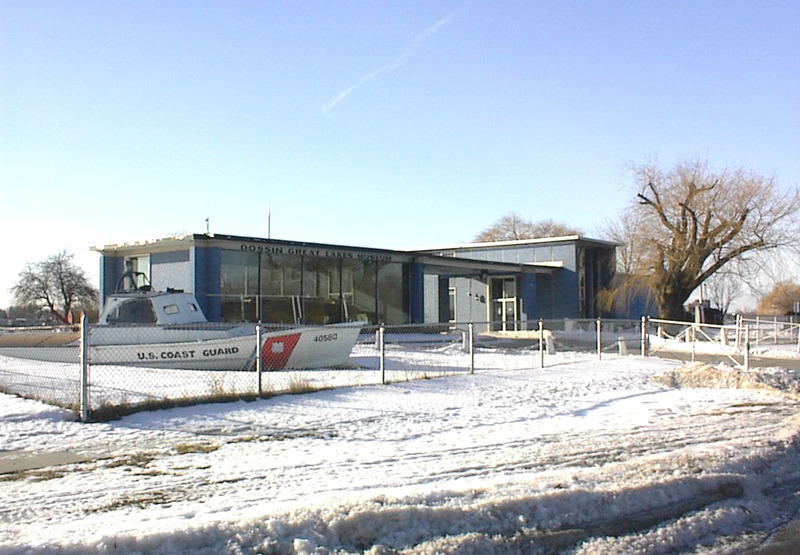 The Great Lakes Maritime Institute is a Detroit non-profit organization that supports and promotes the Dossin Museum. The Museum is now administered by the Detroit Historical Society whose main facility is in the Cultural Center on Woodward. The architect, William E. Kapp, was trained in architecture at the University of Pennsyulvania and spent many years working in Detroit, for some period with the Smith, Hinchman and Grylls firm. He may also have worked for the Harley, Ellington and Day architectural firm in Detroit He designed - or helped to design - the Detroit Historical Museum and the University of Michigan's Horace Rackham Education Building in the Cultural Center, the Wilson Theater, the University Club and the Players Club - both nearby on East Jefferson and the Art Deco Temple Isreal on Manderson near Palmer Woods. The Dossin Museum was closed in November, 2012 for a two million dollar remodling and reopened in May 2013. This is another example of the gradual renovation of Belle Isle.